Resistance analysis of milling cutters produced of different materials and alloys has been performed. The analysis demonstrates that steels of the same hardness characteristics can display different resistance. Typically, tool life increases with increasing its hardness. The presented tool materials turn out to have different carbide phase contents. The increased carbide phase content results in increasing the resistance of steels and alloys, though they feature the same hardness. The graph illustrates the effect of the carbide phase percentage on relative wear resistance of steels and alloys. A newly developed heterogeneous material can be used for cutter manufacturing. The material has a wear-resistant structure, a favorable structure combination and a complex of physical and mechanical properties: the combination of high hardness and viscosity; vibration damping; lowering E (elasticity modulus), which reduces voltage; providing self-sharpening; high resistance to compression, bending and shear. Keywords: hardness, wear resistance, carbide phase. 1. Tenenbaum M.M. Wear resistance of structural materials and machine parts in abrasive wear. – Moscow: Mashinostroyeniye, 1966. – 332 p.
2. Grube A.E. Woodcutting tools. – Moscow: Forest Industry, 1971. – 344 p.
3. Gusev S.V., Gusev A.S. The use of heterogeneous material to improve the flexural strength of the teeth of the cutting tool // Engineering industry and life safety, 2009, № 6. – P. 97-99. 4. Gusev S.V., Gusev A.S. The general equation of tool wear when cutting wood // Engineering industry and life safety, 2010, № 7. – P. 94-96. 5. 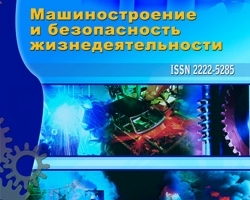 Gusev S.V., Gusev A.S. Assessing the role of vibration and thermal cycling stresses during wear the tool material // Engineering industry and life safety, 2011, № 1. – P. 25-27. 6. Gusev S.V., Gusev A.S. The theoretical justification for self-sharpening effect // Engineering industry and life safety, 2011, № 3. – P. 44-47.